Supermodel Naomi Campbell dressed to kill at Princess Eugenie‘s wedding to her long-term partner Jack Brooksbank yesterday. Campbell, 48, wore a metallic black ombré Ralph and Russo Couture cocktail dress and cropped cape, featuring hand-woven silk tweed, crystal stones and a feather. 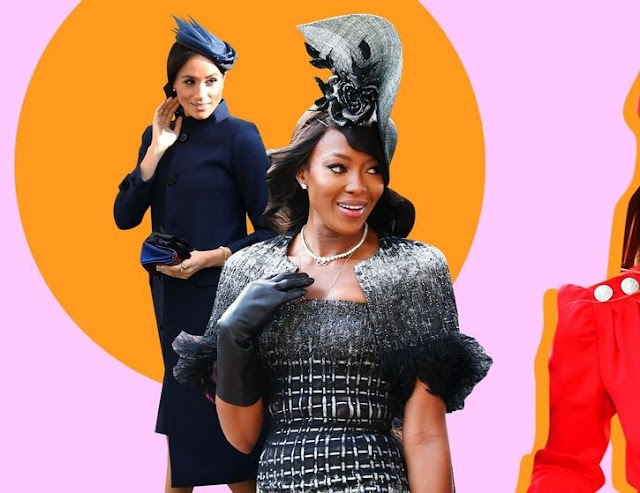 She also added a very impressive floral-embellished fascinator (which was secured tightly and didn’t move despite the wind) and, taking a cue from royal protocol, she crowned the Internet-breaking look with matching stockings and chic pumps and a diamond necklace. Princess Eugenie married her fiancé Jack Brooksbank at St George's Chapel in Windsor Castle in front of 850 guests. The Queen's granddaughter, who is ninth in line to the throne, was watched by her grandmother, the Queen, and Prince Philip, along with other members of the royal family.